Wild Hope Farm’s Peanut Belk is presenting to the Charlotte’s Sierra Club on Sustainable Farming. Come learn how we use regenerative agriculture and permaculture design in our diversified vegetable, laying hen, and flower farm in Chester, SC. Visit Wild Hope Farm’s booth at the Catwaba Land Conservancy's 3rd Annual Pop-up Picnic! The event is a celebration of local farms, food and conservation. Come spread a blanket and enjoy a relaxing evening outside with family and friends at The Mint Museum Park. Pick up a pre-ordered picnic basket, bring your own picnic meal or enjoy dinner from the New Wrap Order food truck. Wild Hope Farm’s Peanut Belk is presenting in Wing Haven’s Winter Lecture Series on Sustainable Farming. Come learn how we use regenerative agriculture and permaculture design in our diversified vegetable, laying hen, and flower farm in Chester, SC. Wild Hope Farm's Shawn Jadrnicek and Katherine Belk will co-present at CFSA's 2018 Sustainable Agriculture Conference in Durham, NC. Join us for a talk on Farm Designs and Techniques to Save Time and Money. Piedmont Culinary Guild has partnered with CEFS (Center for Environmental Farming Systems) for this chef and farmer pairing - a celebration of year-round local food. As a part of the event, Wild Hope Farm is partnering with Chef Ashley Boyd at 300 East to prepare a meal fresh from the farm. 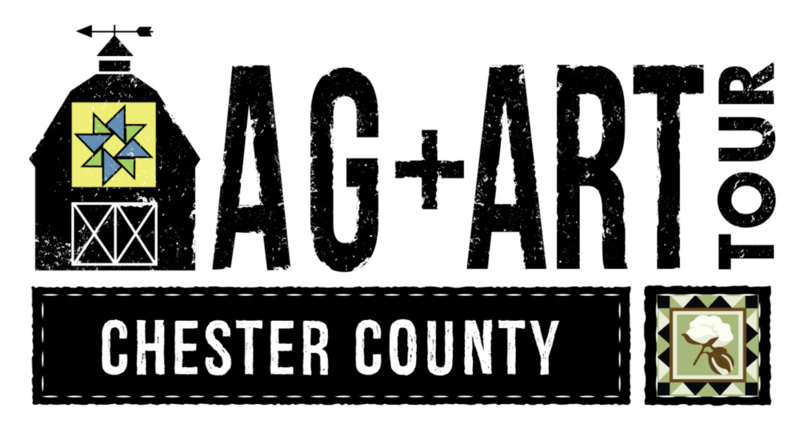 The evening will also feature multiple food artisans, local brewers, distillers, and wineries. Attendees will enjoy the wonderful tasting event as they stroll through Daniel Stowe Botanical Garden, enjoy live music, and listen to speakers who will talk on food-related topics. 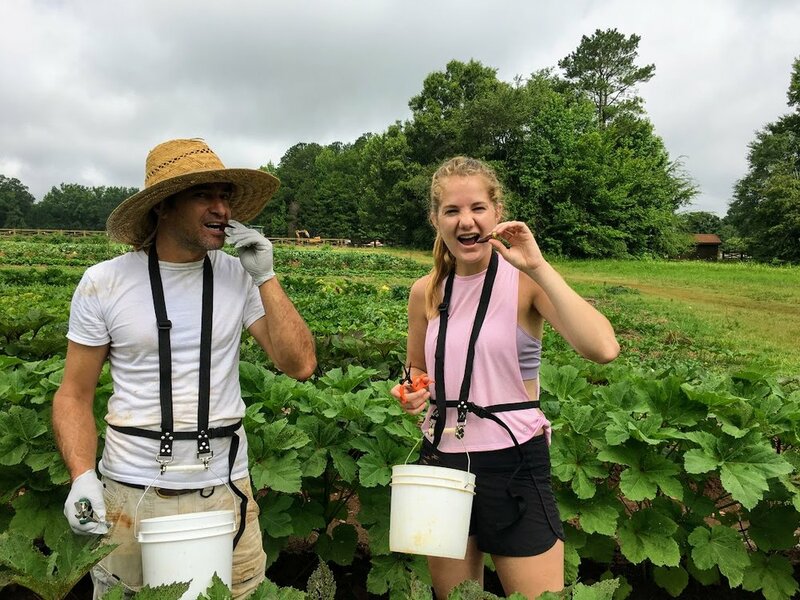 Volunteer Brookie Mcllvaine (right) and farm manager, Shawn Jadrnicek (left) harvesting Okra! Wear long sleeves! Looking to get grounded? Get your hands dirty with us in this piece of paradise right outside the Queen City! We are open to volunteers every Funday Friday 9am-12pm. LET US KNOW IF YOU PLAN ON COMING, contact our volunteer coordinator. Activities may include harvesting, packing CSA shares, arranging flowers, packing for the Matthew's Farmers market, weeding, cleaning bins, dead-heading flowers, transplanting, etc. Weather can vary from rain to shine, so come prepared with big hats, long sleeve shirts, boots or tennis shoes (whatever is most comfortable for you) and sunglasses. In the summer, you will sweat a lot so bring water and you can refill here! Be prepared to LEARN and LAUGH A LOT with your farm crew. 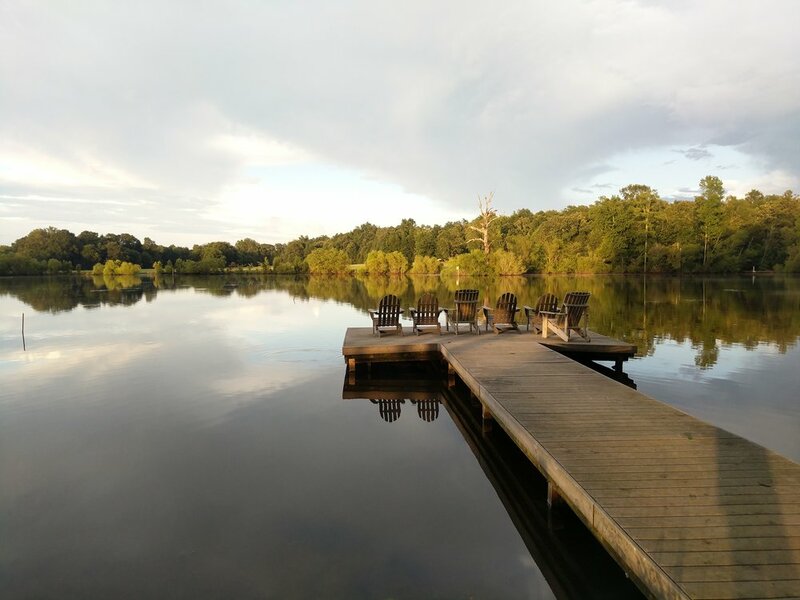 Bring your lunch and have a picnic by the pond and/or take a self-guided walk on our trails. If Fridays do not work for you--that is okay! Contact our volunteer coordinator and she can find a time that works for you. Please do know that on the weekend the farm crew will be taking time to rejuvenate or host events, so the farm will not be open for volunteering (unless specified on the event description)! Volunteer Coordinator/Apprentice, Molly Belk with her watermelon baby. 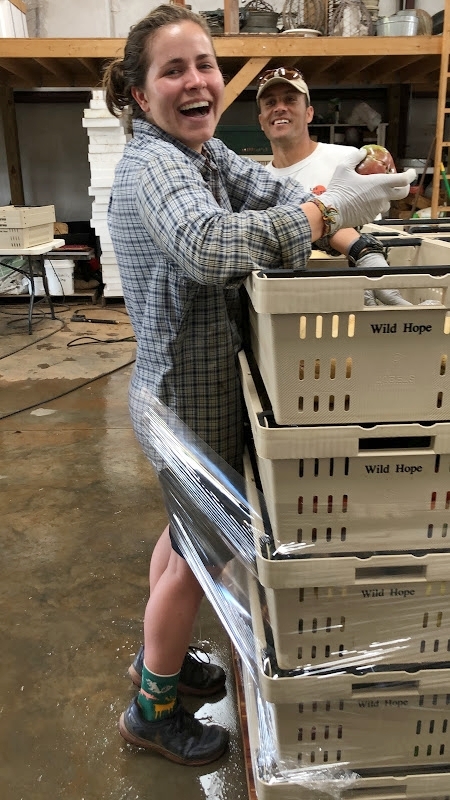 Volunteer Coordinator/Apprentice, Molly Belk, got caught in the plastic when wrapping the CSA shares for delivery. Join us for Farm to Brew on Monday, August 6th! It's a Four Course Beer Dinner with a selection of produce sourced and paired with LRB Beer! Hear from the farmers, chefs and brewers as they present this incredible dinner. Menu to be announced. Tickets are $75 per person and available in house ONLY at LRB. You must come by LRB to purchase a ticket. Join us for a dinner by Chef Bruce Moffett celebrating our local harvest & beers, the longest hours of daylight, and the magic of Midsummer. This farm-to-table dinner will take place at Resident Culture Brewery and will feature delicious eats from Wild Hope Farm, North Corner Haven, Orrman’s Cheese & Community Culinary School of Charlotte. We are excited to host an Organic Farming Workshop for the Catawba Farm and Food Coalition! The Catawba Farm and Food Coalition facilitates and supports the development of a secure and sustainable food system in Chester, Fairfield, Lancaster, Union, York Counties and the Catawba Indian Nation. During the workshop you will visit the farm to learn more about our organic growing practices from the one and only, Shawn Jadrnicek! 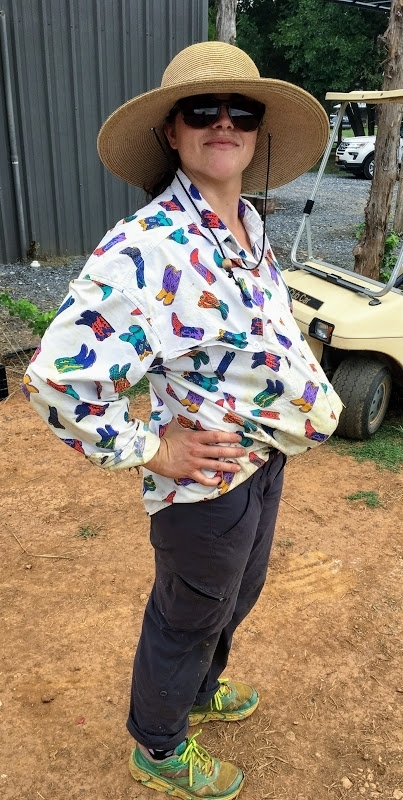 Shawn has nourished his interest in sustainability through work as an organic farmer, nursery grower, extension agent, arborist, landscaper, and manager of Clemson University's Student Organic Farm. From his earliest permaculture experiments with no-till farming in the Santa Cruz Mountains to his highly functional bio-integrated designs in the Southeast, Shawn has learned how to cultivate food in a variety of climates and landscapes. He shares his creative solutions through teaching, consulting, design work, and his book. Join me Saturday morning from 10-12 pm at The People's Market at Dilworth for some fresh veggies and yummy homemade bread. You can expect to find brussel sprouts, cabbage, broccoli, sour dough bread, kale, collards, mustard greens, turnips, beets, and colorful carrots! GET YOUR FALL VEGGIES ON! Stop by Lenny Boy for some FREE 10 am yoga followed by the Wild Hope Farm pop-up market from 11- 2 PM. We will have a diverse assortment of fresh produce and a limited supply of our popular sour dough bread and yummy, colorful eggs. Come early to get the good stuff! Including but not limited to broccoli, cabbage, kohlrabi, red beets, kale, rainbow chard, collards, turnips, mustard greens, and more! Wild Hope Farm will have a booth at Catawba Land Conservancy's Taste for the Land fundraiser. The event will celebrate local farms, local food and land conservation, featuring seasonal hors d’oeuvres, beer, wine, signature cocktails, live music by Dead Man’s Banjo and an onsite farmers market. Follow up your 9 AM cardio core or 10 am yoga boot camp with some fresh, Wild Hope Farm produce at Functional Fit Charlotte. We will have our booth set up for you to buy vegetables, eggs, and bread after classes so that you can start your weekend off right! Come to Charlotte's south end brewery and enjoy our fresh fall harvest! Start your Saturday right with free yoga followed by a kombucha and delicious + nutritious produce from Wild Hope Farm.